Part of being a web developer is testing things that will inevitably break in insane and unexpected ways in Internet Explorer. Luckily, you can spin up a free Virtual Machine (VM) and run Internet Explorer in all its Windows XP (or Windows 7) glory using VirtualBox. Currently supported by this article: IE6, IE7, IE8, IE9, IE10, and IE11. 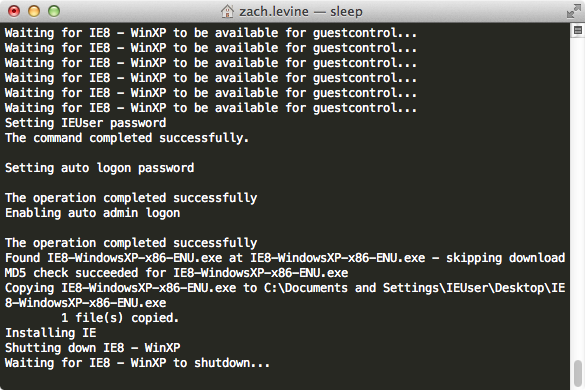 Launch Internet Explorer from your Mac! Visit the VirtualBox downloads page and download and install the latest VirtualBox version "for OS X hosts". If you already have VirtualBox installed, make sure it's running the latest version by comparing the version on the VirtualBox downloads page with your installed version's About information. As I found out when I was running 4.3.X, running the "Check for Updates" menu item in VirtualBox doesn't always detect a new version (5.X as of when I wrote this guide). In VM lingo, the computer you're on is the host machine, and the computer you're running inside of the VM is the guest machine. You have the option to install all available versions of Internet Explorer at once, or install only specific versions. To install specific versions, you'll need to run each command separately. Copy and paste the command(s) below into Terminal and press Enter. Don't include the commented (#hash) portion. You'll be prompted for your OS X password. If you run into any permissions-related issues, you can run the command using sudo (super user) by prepending each command above with sudo. If you have any issues running the "Install all versions" command, check to make sure you have the latest version of VirtualBox and, if you still have issues, try installing each VM separately instead. If you run into an error similar to VBoxManage: error: Appliance import failed or 'Win7/IE11 - Win7.vbox' already exists, try this solution. The "Install all versions" command will also attempt to install the Internet Explorer Edge version -- this is the absolute latest release of IE. However, installation using this method is unreliable, so if you see an error at the end of the script you can safely ignore it (unless you want the Edge browser, of course). If you really want the Edge version, you'll need to do a bit of troubleshooting of your own. This may take a while. The amount of time it takes to download and install each disk image will depend on how fast your internet connection is. Open VirtualBox by navigating to Applications > VirtualBox.app. 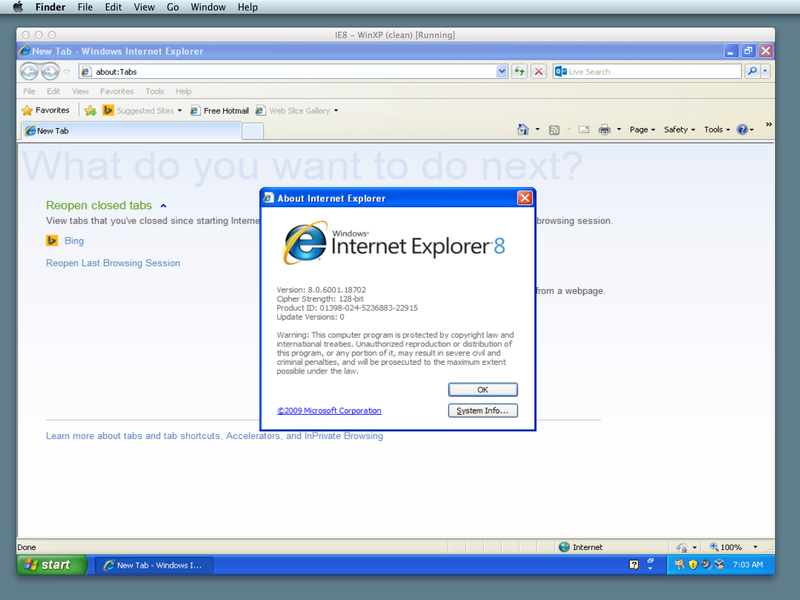 Then, select the VM containing the version of Internet Explorer that you'd like to launch, and click Start. The Virtual Machine will now spin up! All hail the nostalgic Windows XP startup sound. If you do local development (like a local MAMP/WAMP server) or you need to route traffic through a VPN, you'll need to edit each VM's hosts file (inside of Windows) and modify the values there to match your local OS X hosts file configuration. The Windows images you're using inside of the VM are completely legal and free -- however, their licenses expire every 30 days and must be refreshed by loading an older "snapshot" of the VM. I recommend you create a snapshot of each VM right now (or maybe after you've configured your hosts files for local development). 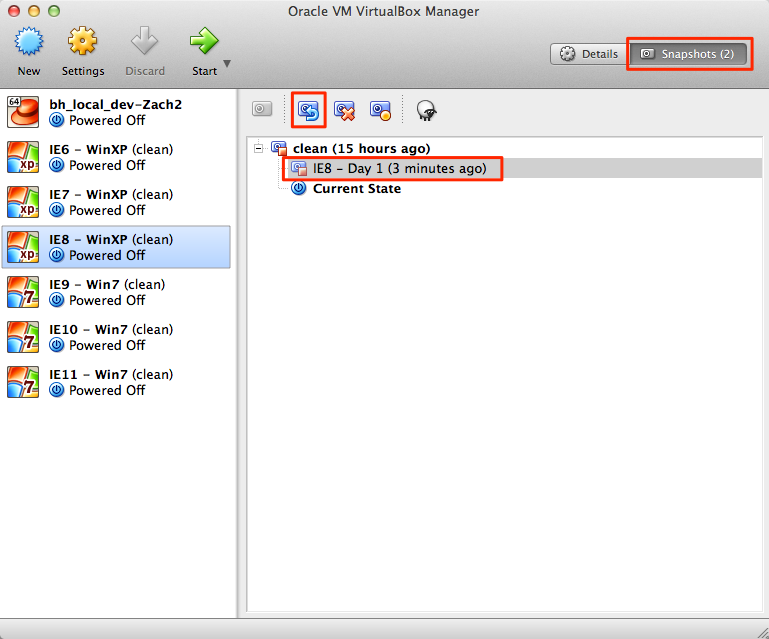 When your license for each VM expires in 30 days, you can simply restore your VM to this snapshot, effectively resetting your 30-day license to day 1. 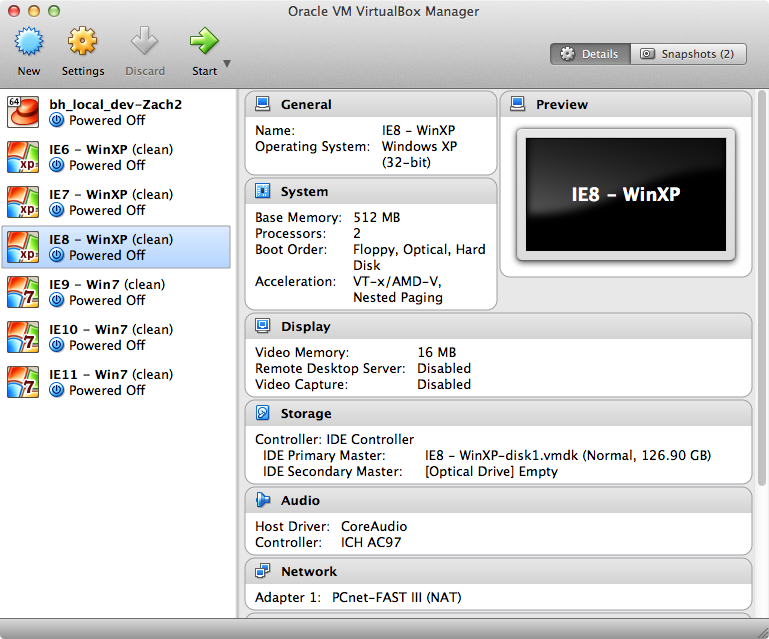 Open VirtualBox, select the VM you'd like to refresh, and click the Snapshots tab. Then, click the "Take Snapshot" icon. Then, select the "original" snapshot (should be named "Clean", and click the "Restore Snapshot" icon. This will preserve the snapshot you just took, and switch you back to the original one so that you can use your new snapshot (which I've named "Day 1" after your license expires. Open VirtualBox, select the VM you'd like to restore to, and click the Snapshots tab. Then, click the "Restore Snapshot" icon. You've just turned back your license clock! You're basically a time traveller. Good work. Post below and I'll help you out!